Why would that be a warranty issue? You wouldn't see this kind of failure with steel! Ride whatever you want but don't ride again carbon frames.. How safe can a material be if it brakes from a 1/4" stick grabbed in the wheel? It is supposed that a bike's frame must hold a minimum of shocks, even if these come from improper use, accident, heavy load of anything.. I would have sued the company for putting in danger the rider's life. Trek has a lifetime warranty policy. It covers manufacturer's defects, which is not the situation here. I'm guessing the emails you got were from people who were mad that they crashed their bikes and couldn't get a free replacement. I doubt any company, not just Trek, would warranty a frame like that. In my opinion, there is no warranty for an object going into your wheel and damaging your equipment. Sorry for you. Now get a Colombus or Reynolds steel frame. Also a titanium frame is a lifetime (almost) investment. Is this Chevy? Hi, I purchased a Corvette last week and accidentally backed it into a retention wall. So..... I wanted to know when I can bring it in for warranty. What? That isn't covered under warranty? Are you kidding? What kind of company are you????? Carbon fiber is stronger that steel or aluminum, but behaves differently when it is overloaded in an accident or impact. An overloaded metal part will bend or deform, showing evidence of the load (Figure 1). A carbon fiber part that is overloaded will not bend or deform, so a damaged carbon part may look normal after the same impact that bent the metal part. When the sum of the forces finally exceeds the strength limit of the carbon fiber, the carbon fiber part still does not bend—it breaks (Figure 2). NO, I do NOT work for Trek. When was the last time Trek sold a 9800? Maybe you meant "only 10 years old", not "10 rides old". If you just broke a 9800 your not the first owner, therefore no warranty. By yourself a new bike and Trek WILL warrant it. If you (or your gf) wanted th duability of steel, then I guess you shouldn't have purchased a carbon fiber mountain bike. It's like a good friend of mine used to say: If you want a pizza, get a pizza. - MTB steel frame at seatpost lug near the seat post, no bending seat post (the only warranty I asked). - cinelli road aluminum handlebar (found because of sound and strange moving). Didn't asked warranty, it's stress related. - numerous aluminum rims, steel DT 14g spokes. All stress fatigue, and I didn't ask a warranty. I don't ask a warranty if I hit a pothole that destroyed my rim, destroyed my hubs, chain, cog, etc. I would not really trust carbon even if my centaur rear derailleur have a carbon plate and my fork Kinesis-Easton have lower legs in carbon. Guys, choose two between: price, weight and solidity!!! It has nothing to do with fatigue life. It has everything to do with ultimate strength and the mode in which carbon composites fail (snap!). Lesson learned: don't buy a carbon frame ever again. (sigh) Too bad Trek can't build a bike that is meant for normal riding anymore. Gosh, remember the 80's? There are still Trek bikes from the 80's out there on the street. So I was riding a long and because of the oscillating frequency of my bladed spoke, a worm hole opened up, a stick came out of it and lodged its self in my chainstay which made it break. I think you should look into this serious matter before Marlene and her Lawyer try and produce a clue out of that same wormhole. I love Trek CF. I've had my Trek OCLV 9800 carbon fiber bike since it hit the store on day one. I ride it in a very hilly area 35 miles a week. I've also done a few fairly hard (not crazy) jumps when I was younger. To this very day, it performs like a champ and I love this bike. CF is good at several things (such as screaming up hills while you leave your friends behind -I'm 55 & leave 25 year olds in my dust). It is not good at taking hits with lateral pressures (down tube etc). Read the manual where it clearly states if you damage CF in certain ways, it weakens the integrity of the material and the bike becomes lethal to the rider. Ride it as designed, and it will last for decades. Will a Carbon-Fiber bike last? 2/26/10 Update- The article below was written back in 1996, 14 years ago. It's still relevant, but since then we've seen the super-light ultra-performance carbon frame move into moderate price levels. It no longer defines the extreme high end. That's good news, but carries a warning. You cannot build a 2.5 pound carbon frame as strong as a 3.5 pound frame. 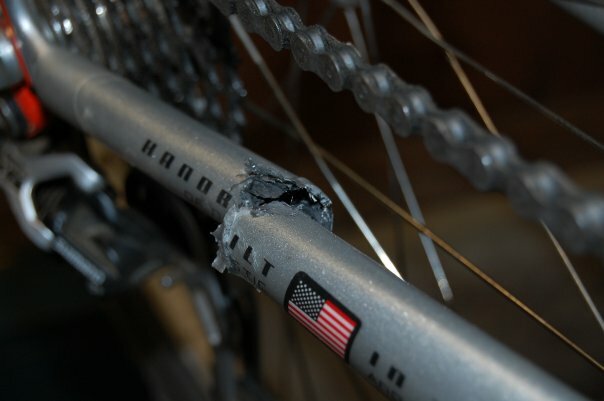 The tube walls are thinner, and when even the highest-quality-possible construction (as found on Trek's OCLV product), the can still easily damaged by forces not normally encountered when riding. Blows to the side of a tube, for example, will likely cause them to crack. Normal riding isn't an issue; the modern Trek OCLV will likely outlast frames made of any other material. But making them so light, so comfortable, so efficient... there is a trade-off in durability when abused or crashed. We recommend a very thorough inspection of crashed frames of any material, but carbon even more so, because it's difficult finding under-the-surface damage. Riding a frame that has been crashed could cause unexpected failure down the road. Please, if you have any doubts, bring such a bike in for inspection. We cannot guarantee that it's perfect, but we may be able to find an indication of trouble that others missed. You are offered with response to questions concerning billing payment. DIRECTV Bill Pay Get in DIRECTV as the company name as the city code.